Not to be confused with Goggles! or Google. Goggles, or safety glasses, are forms of protective eyewear that usually enclose or protect the area surrounding the eye in order to prevent particulates, water or chemicals from striking the eyes. They are used in chemistry laboratories and in woodworking. They are often used in snow sports as well, and in swimming. Goggles are often worn when using power tools such as drills or chainsaws to prevent flying particles from damaging the eyes. Many types of goggles are available as prescription goggles for those with vision problems. The Inuit and Yupik people carved Inuit snow goggles from caribou antler, wood, and shell to help prevent snow blindness. The goggles were curved to fit the user's face and had a large groove cut in the back to allow for the nose. A long thin slit was cut through the goggles to allow in a small amount of light, diminishing subsequent ultraviolet rays. The goggles were held to the head by a cord made of caribou sinew. In the early 20th century, goggles were worn by drivers of uncovered cars to prevent irritation of the eyes by dust or wind. Likewise in the first ten years after the invention of the airplane in 1903 goggles became a necessity as wind blow became more severe as aircraft speeds increased and as protection against bugstrikes at high altitudes. The first pilot to wear goggles was probably Charles Manly in his failed attempt to fly Samuel Langley's aerodrome in 1903. Cold weather: Most modern cold-weather goggles have two layers of lens to prevent the interior from becoming "foggy". With only a single lens, the interior water vapor condenses onto the lens because the lens is colder than the vapor, although anti-fog agents can be used. The reasoning behind the dual layer lens is that the inner lens will be warm while the outer lens will be cold. As long as the temperature of the inner lens is close to that of the interior water vapor, the vapor should not condense. However, if water vapor gets between the layers of the lens, condensation can occur between the lenses and is almost impossible to get rid of; thus, properly constructed and maintained dual layer lenses should be airtight to prevent water vapor from entering between the lenses. Swimming: Must be watertight to prevent water, such as salt water when swimming in the ocean, or chlorinated water when swimming in a pool, from irritating the eyes or blurring vision. Allow swimmers to see clearly underwater. They will not be usable more than a few feet underwater, because the water pressure will press them tightly against the face. (Below this limit, a diving mask must be used, which allows the user to equalize pressure by exhaling air through the nose.) Examples of these include Swedish goggles. Power tools: Must be made of an unbreakable material that prevents chunks of metal, wood, plastic, concrete, and so on from hitting or piercing the eye, usually polycarbonate. Usually has some sort of ventilation to prevent sweat from building up inside the goggles and fogging the surface. Blowtorch goggles: These protect the eyes from glare and flying sparks and hot metal splashes while using or near a blowtorch. They are not the correct filters for arc welding. Welding goggles: Includes all goggles for eye protection during welding or cutting. They provide protection against debris, the heat from welding, and, with the proper filters, the optical radiation resulting from the welding, which can otherwise cause arc eye. Motorcycle riding and other open-air activities: Prevents insects, dust, and so on from hitting the eyes. Laboratory and research: Combines impact resistance with side shields to prevent chemical splashes reaching the eyes. May also include laser protection which would be covered by EN 207 (Europe) and ANSI Z 136 (United States). Examples of these include red adaptation goggles. Racquetball: Protect the eyes from racquets swinging in an enclosed area and from impact from hard rubber ball. Winter sports: Protect the eyes from glare and from icy particles flying up from the ground. Double lens anti-fog ski goggles were invented and patented by Robert Earl "Bob" Smith. Astronomy and meteorology: dark adaptor goggles are used before going outside at night, in order to help the eyes adapt to the dark. Basketball: Several NBA players have worn goggles during play, including Kareem Abdul-Jabbar, James Worthy, Horace Grant, Kurt Rambis and Amar'e Stoudemire; they prevent a fellow player from scratching or hitting the eyes when trying to grab the basketball. In most circumstances, a player starts wearing protective goggles to prevent further injury to the eyes. Aviation: In open cockpit aircraft, such as old biplanes, aviators, such as Amelia Earhart and Charles Kingsford Smith, would wear goggles to help protect from the wind and are still in use today. Examples of these include the AN-6530 goggles. Virtual reality: A virtual reality headset, sometimes called "goggles", is a wrap-around visual interface to display computer output. Commonly the computer display information is presented as a three-dimensional representation of real-world environments. Drunkenness: Goggles designed to simulate the vision altering effects of psychoactive drugs, in particular alcohol. Examples include Fatal Vision goggles. Goggles are often worn as a fashion statement in certain subcultures, most often as part of the cybergoth subculture. They are usually worn over the eyes or up on the forehead to secure 'falls': a type of long, often brightly coloured, synthetic hairpiece. Fans of the steampunk genre or subculture also frequently wear steampunk-styled goggles, particularly when performing in a live action role-playing game. Goggles are also frequently used by anime and manga characters as a fashion statement. For example, it is an idiosyncrasy of team leader characters in the Digimon anime to wear goggles. Other notable characters who wear goggles are the young Naruto Uzumaki and Konohamaru from Naruto, Matt from Death Note and Usopp from One Piece. A US Military working dog attached to a helicopter hoist in Afghanistan. 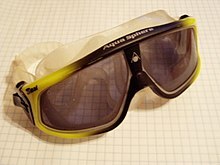 Goggles are available for horses used in speed sports such as horse racing. In some traditions of horse mounted bullfighting, the horse may wear a protective cloth over its eyes. Goggles have been used on military working dogs, for protection in harsh conditions, such as sandstorms and rotorwash from helicopters. One of the brands of these types of goggles are Doggles. Wikimedia Commons has media related to Goggles. ^ Alfred C. Harmsworth (1904). Motors and Motor-driving. ^ "Ski goggle pioneer Bob Smith dies". Msn.foxsports.com. 2012-04-27. Retrieved 2012-04-27. ^ Landers T. A. (2006) Professional Care of the Racehorse, Revised Edition: A Guide to Grooming, Feeding, and Handling the Equine Athlete. Blood Horse Publications. 308 pages. Page 138. This page was last edited on 5 November 2018, at 06:05 (UTC).